The Passion of Christ, or Easter Week, known in Spain as Semana Santa is without doubt the most important celebration in Spain. 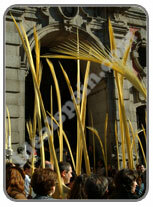 The festivities begin with the Domingo de Ramos (Palm Sunday) and end with Lunes de Pascua (Easter Monday). It is a celebration of life itself and the whole country comes alive. The Catholic Church in Spain is passionate about Easter celebrations. Almost every town and city in Spain will have their own Easter celebrations and almost every resident will be involved in some way. In the major cities the processions are of huge proportions, often stretching for miles. Each area, city and town has its own accent on its celebrations. They all differ but in common they all portray life, colour, culture, music and dance, all with a very religious meaning. Everywhere, processions make their way through the streets, carrying religious icons and symbols of their faith. In Seville alone there are over 100 of these such images. Semana Santa has to be experienced first hand to be fully appreciated and no words can begin to describe the emotions that flow like water, wherever you go. If you have the opportunity to sample these festivities, one thing is sure, the images of the solemn masses and processions will stay with you forever. The way in which many villages and towns celebrate Holy Week is so very different and one such example is Almaden de la Plata near Seville. On Easter Sunday, rag and straw dolls representing famous people are placed at different points in the streets of the village. These are finally torn apart and the pieces thrown into the air. In Castilblanco de los Arroyos, they place the same kind of dolls in the streets but they are later set on fire. The dolls are known as juas or Judas dolls. There are many towns that celebrate with battles between ancient brotherhoods. In major cities such as Malaga, the processions go on for miles and will last until the early hours of the morning, every night through the Easter week. Children as young as 3 or 4 take part and crowds will swell into hundreds of thousands. Some of the images are quite haunting. You will find, anywhere in Spain, during the celebrations that accommodation is very difficult to find, especially in the cities. Many people resort to booking a year in advance. You may also find that the price of accommodation will be artificially inflated for this week. This is the main ritual practiced in Spain at Easter. The streets are used as a grand stage for religious and passionate displays of devotion to Christ. People dress as members of ancient brotherhoods and parade through the town. This is a traditional Easter ritual that can include a procession of giants, monsters and devil like creatures. Often made of straw and sometimes made to resemble famous people, these dolls are burned in the streets. The name given to the people that carry the floats with the religious statues on. A 'Costal' is a small cushion often carried and used to stop the float causing sores when being carried long distances. These floats can weigh up to 6 tons. Palm Sunday. The first of the Easter Masses and processions. Palms are carried through the town. The palms are used to symbolise the palms that people threw on the road in front of Jesus as he entered Jerusalem. People carry small items made of woven palm which are often later burned. The ashes may be used in ceremonies on Ash Wednesday. The Procession of Silence which is held on Jueves Santo (Holy Thursday). The Holy Burial, honoured on Viernes Santo (Holy Friday). Easter Day on which everyone goes to church and celebrates the resurrection of Christ. 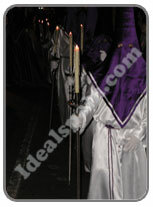 These are people who follow the floats whose appearance could almost be confused with that of the Klu Klux Clan. The cone shaped head gear that is worn is actually due to the belief that it will bring them closer to the heavens. A traditional Easter snack which consists of slices of bread soaked in a mixture of whisked eggs and milk then fried in olive oil and sprinkled with sugar. (Cooked similar to French toast). A traditional Easter cake, with origins in the 15th century. These vary considerably and are often highly decorated.